9th September 2016 FFEI Ltd, the global developer of award-winning digital imaging solutions, today announced several new media handling and digital finishing enhancements, available for all new and existing Graphium hybrid digital inkjet label presses so Graphium enables enhanced Linerless Label production. In addition, FFEI announced the addition of a new orange ink that gives Graphium the widest gamut digital label press available. Extending the range of applications possible with Graphium, FFEI have today announced a thin film modification kit, with ensures Graphium enables enhanced Linerless Label production, making it the first hybrid digital inkjet system able to handle film as thin as 0.5 mil (12µm). For convertors of linerless labels, it now means they can take advantage of the many benefits hybrid label production can bring. Andy Cook, Managing Director of FFEI comments, “For food & beverage, personal care, household and wine & spirit brands, this opens up promotional print opportunities that simply weren’t cost effective or even possible before, such as medium to long run product variants and promotional packaging with full colour VDP.”With Graphium’s new closed loop tension control, advanced encoder and rollers for thin film production, the handling of 12-250um films is now very practical. 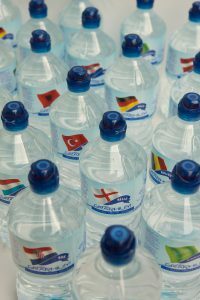 This new capability means that packaging weight and waste can be reduced while maintaining exceptional print quality, ensuring fit-for-purpose products are produced. In addition, Graphium’s inline closed loop lamination enables the precise application of a functional barrier to provide superior rewind without curling. As a hybrid system Graphium is capable of printing both flexo and digital elements in a single pass. To ensure perfect fit and alignment between the digital and flexo printed images, convertors can take advantage of Graphium’s enhanced ‘Dynamic Sync Technology’, which synchronizes digital to flexo using standard sync marks but also dynamically tracks trends within the print run and compensates the digital image for web stretch fluctuations on the fly. Graphium configurations, with a number of flexo units, will benefit from Edale’s Automated Inking, Impression and Registration (AIIR) control system developed in conjunction with AVT for their FL5 and FL3 flexo press. The system receives data from marks read by the AVT Helios camera and then automatically sets up each flexo station correcting pressure and registration within a single press length. Graphium is the first hybrid digital inkjet label press that has the capability to meet the exact requirements needed for producing, fit-for-purpose, finished linerless labels. Graphium’s CMYK ink provides the widest 4 colour gamut for UV ink on the market, exceeding the gamut of many 6-7 colour systems. Graphium’s unique design, including full inter-colour pinning system, combined with Fujifilm ink technology enables wide gamut and excellent adhesion and scratch resistance on almost any media. The Graphium ink set is being extended further with the introduction of Fujifilm’s new orange ink, which will be provided as an option making Graphium the widest gamut digital label press available. Introduction of new orange ink with make Graphium the widest gamut digital label press available. Included in today’s announcement are a range of ‘eye catching’ finishing techniques that can now be applied to enhance the look and feel of labels, digitally and inline, including – back printing, digital varnish, rotary screen emulation, tactile effects and textures, digital cold foiling, plus a range of die-cutting and converting options. Andy Cook, Managing Director at FFEI explains. “Finishing and embellishment can provide the added value for converters that separates labels from printed graphics. Being able to offer new creative enhancements, imaged digitally cannot only help them win new business but also improve margins”. Graphium is the 3rd generation inkjet label press to come out of FFEI’s 10 year’s of Inkjet innovation. Built from market leading technologies and engineering expertise Graphium is the first hybrid digital inkjet press designed specifically for labels, packaging and specialty print. With up to six digital ink channels, Graphium is a high-speed UV inkjet press that is uniquely positioned to offer ultra-high quality printing designed specifically to meet the challenging demands of the industrial label market. The versatility that Graphium provides allows printers to optimize production and maximize profit on every job – increasing the profit margin on every label produced.